It seems all is not well with Nvidia 's DirectX 10 laptop graphics drivers - they haven't been WHQL-certified by Microsoft. To be WHQL-certified means the drivers have passed through the Windows Hardware Quality Labs and are certified for Windows Vista by Microsoft . This is important because DirectX 10 is the graphics platform within Windows Vista . Without the certification, Nvidia can't claim compatibility with DirectX 10. The Inquirer reports that Nvidia originally planned to show off mobile and desktop cards at the current CeBIT show in Hannover, but the company was told late on that certification for the mobile drivers could not be granted. The report says that mobile DirectX 10 cards now won't appear until May, while the mid and low end G84 and G86 desktop parts have slipped back until next month. Nvidia announced its ForceWare 100.65 DirectX 10-compatible drivers for the desktop just under a month ago, but the company still hasn't solved the much-criticised problem of getting dual card setups (SLI) to work with DirectX 10. Nvidia's GeForce 8800-series graphics cards are compatible with the new platform. Even though DirectX 10 SLI still isn't supported with the latest release, DirectX 9 and OpenGL applications will still work with GeForce 8800 cards. Also supported are GeForce 6xxx and 7xxx series cards. 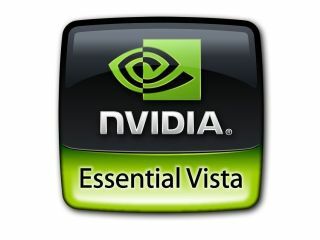 Gamers criticised Nvidia for launching Vista campaigns - such as the 'Essential Vista' logo you see here - before their cards were fully compatible with the new OS.